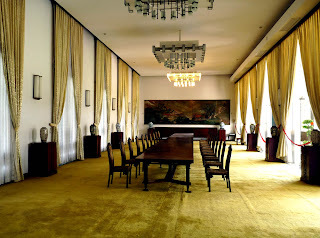 The Reunification Palace is a great place to escape the Saigon traffic for a couple of hours. The admission is outrageously priced at $1 per person. I'm pretty sure I could have bought a lunch off the street for that amount of money. 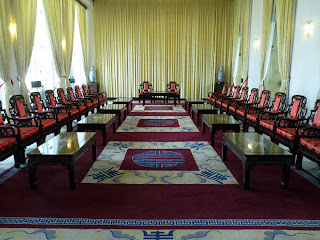 Historically, the palace was very important. 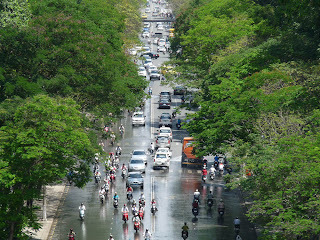 This is where the tanks crashed through the gates and signalled the end of the Vietnam War. 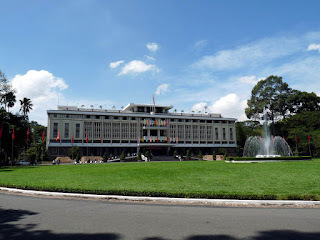 The surrender papers were signed here and North Vietnam was officially reunified with South Vietnam, thereby giving the palace, formerly known as Independence Palace, a new name. There were many interesting photos. The one below shows the tanks breaking through the gates and making a mess of the front lawn. This is a picture I took from the roof of the palace showing approximately the same view. The gates (now intact) are just missing from the front of the photo. This is how the palace looks today. Architecturally, it may appear quite bland but the facade contains a lot of symbolism. The lines of the building actually represent chinese characters which mean good, master, prosperity, mouth, three (for humanity, intelligence and strength) and prosperity. For a better explanation, you can check out this web page. 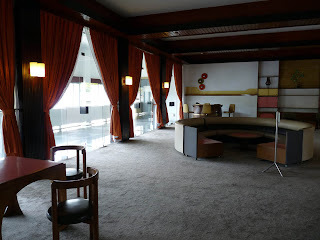 The rooms are, as expected, quite formal but unfortunately many of them looked like they suffered from the styles of the late 60s and early 70s. 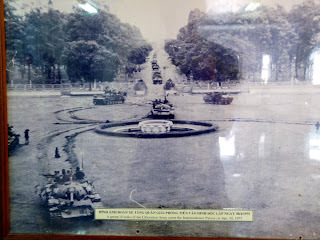 Outside, there were replicas of the tanks that broke through the gates in late April of 1975. 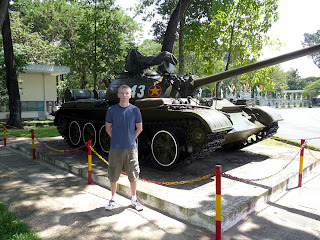 Okay, okay, I promise I won't pose beside any more tanks trying to look like I'm in the military.